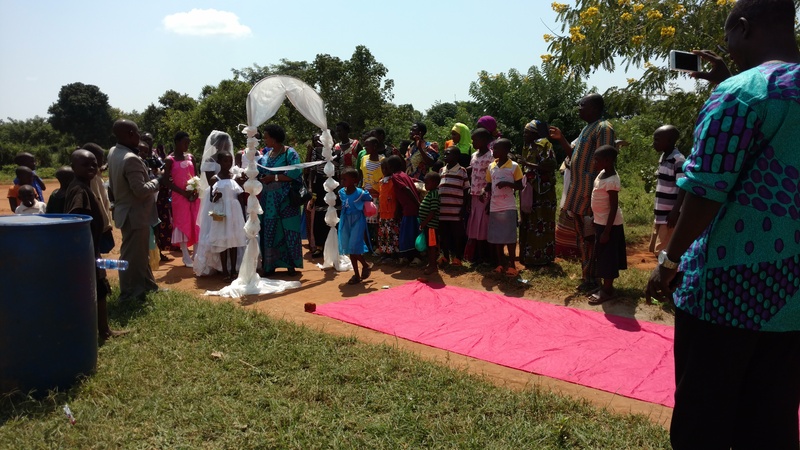 TU III Post 7 – Sat – A Building to Finish, and Wedding in Nabigaga! 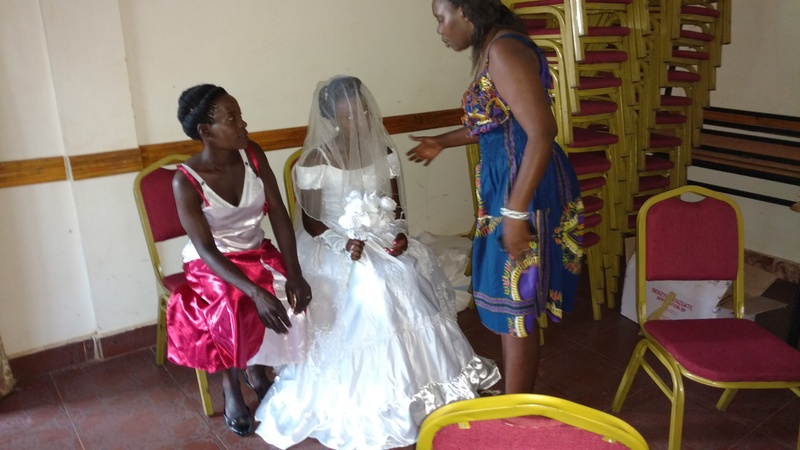 The day of the big wedding between Alex and Judith had finally come! 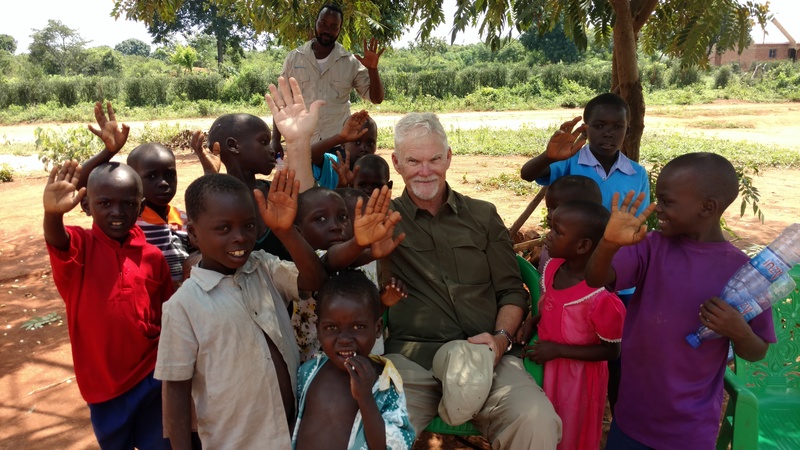 We drove off to the village of Nabigaga, where the wedding was to be held, were we had dug a very successful “borehole”, and where work was being completed on a building for one of the “anchor churches”. The borehole or well was the second well that was funded by the donations of Serrano Jr. High School students, and when I arrived it was impressive indeed. The well is just down from the church, about several hundred yards walk. It is owned by the church, but open to all residents. It was heartening to see the joy on people’s faces when they were drawing water! 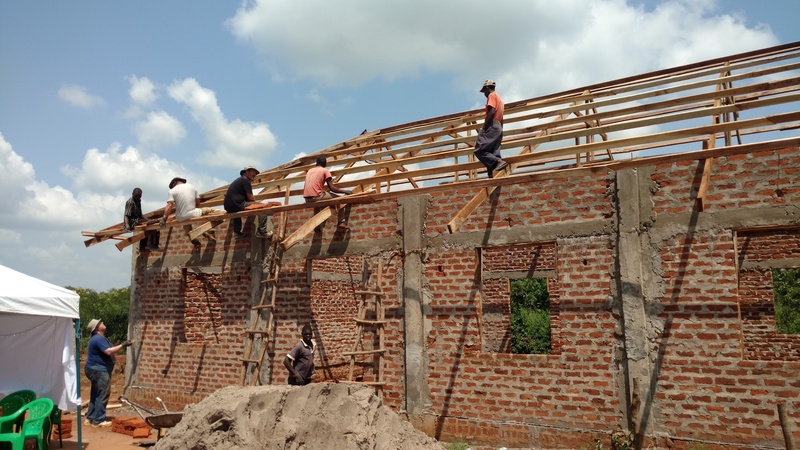 Our amazing construction team – Mark, Levi, Greg, and Paul – had been here most of the week, working along the CTM Uganda volunteer to try to finish the church building for the wedding. At the start of the week the walls were not even finish! But that was soon resolved through their zealous efforts. By Saturday morning, the trusses were up and they were getting ready to put on the roof. Alas but this was not quite ready for a wedding feast, so tents were set up just outside the church. Everything fell into place. The bride was in a vehicle behind us, in eager anticipation of the event. She was adorned in a gorgeous white gown, radiant with beauty. 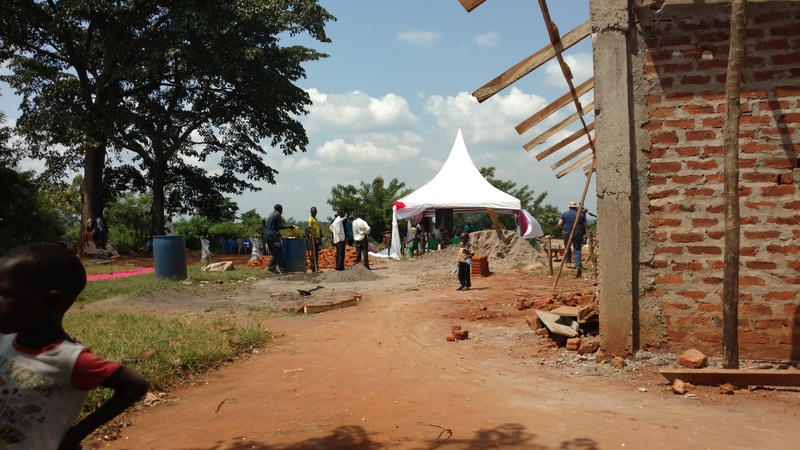 We arrived to see that two white tents had been set up just adjacent to the building under construction. 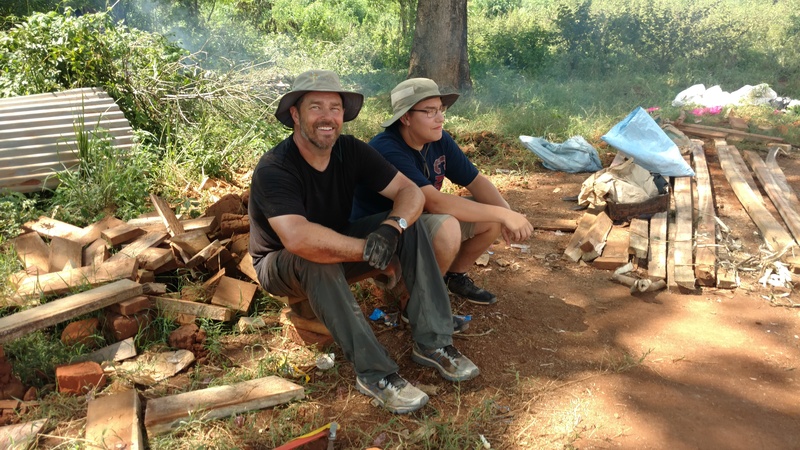 Greg, Mark, and Paul were busy with the locals in completing the brickwork and roofing. They were working feverishly, and in good spirits. Some women were further off, cooking hot food for the event. And workers were in process of setting up the facilities – tables, chairs, etc. People from Nabigaga were gathering for the event, and the excitement was building! An entry way was provided for the couple, along with a red carpet along which to walk. Alex was in his home, awaiting preparations. We arrived at the entry point, and the bride was escorted through the white arch, enroute to her place at the ceremony. Alex then joined her, and the event began with great joy, music and singing. Such a happy event! 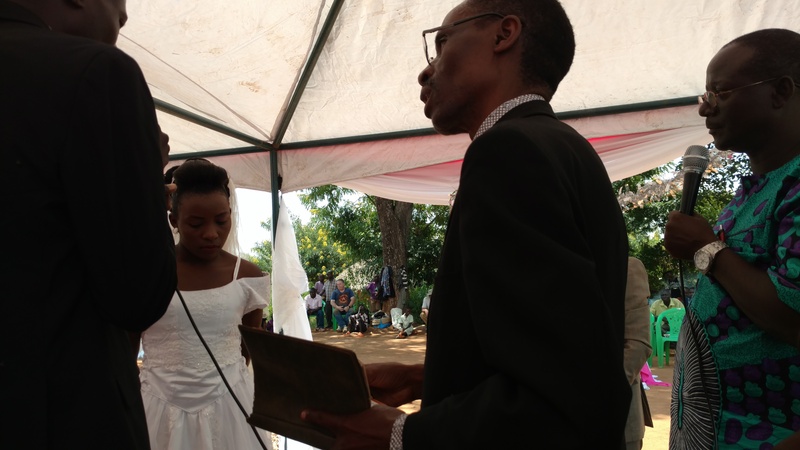 Arthur presided over the wedding ceremonies, explaining the importance of marriage, and asking them to make their vows to one another. They did, carefully and emphatically. Rings were exchanged, and as the bible says, the two began their journey to become “one flesh”. Previous PostTU III – Post 6 – Bicycles for Pastors, Medical Teams Break Records!Next PostRoof on at Nabigaga Church, Bikes on the Way to Pastors!